Just in time for Christmas, John Dewars & Co have launched The Deveron 10, 12 and 18 year old from their MacDuff distillery. John Dewar & Sons has now launched The Deveron single malt whisky range which is the fifth and final Dewar’s owned single malt to join their “The Last Great Malts of Scotland”; a range of new expressions, including some never before released single malts from each of John Dewar & Sons five malt whisky distilleries, namely Aberfeldy, Aultmore,Craigellachie, Royal Brackla and Macduff. Even the most ardent whisky connoisseurs amongst you could be forgiven for not recognising The Deveron name as a single malt, as it differs from most other Scotch single malt whiskies in that it isn’t named after the distillery it was produced in. 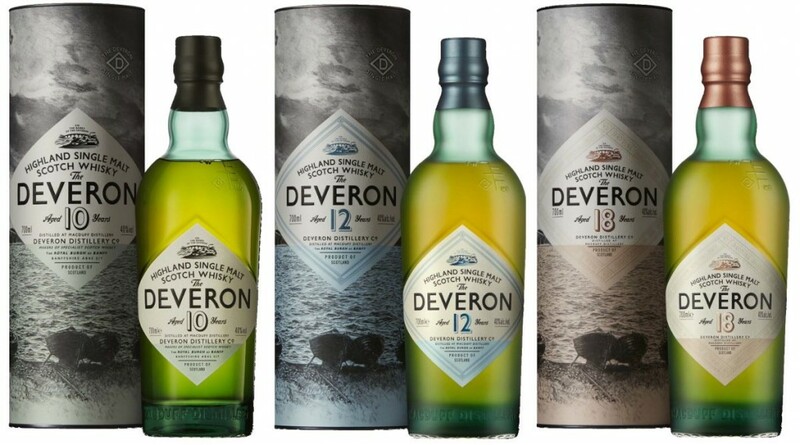 The Deveron, as it will now be known has been rebranded from Glen Deveron a name which some of you will be vaguely familiar with, it is produced at the Macduff distillery which was built in 1963. The reason the whisky wasn’t named Macduff is the Distillers’ Company Limited, now Diageo, own the brand name Macduff. Most of the whisky produced since the distillery’s construction has gone into blends such as William Lawson’s although some has been sold as single malt under the name Glen Deveron. Glen Deveron was first released as a single malt in the late 1960s at 5 years old then in the mid-1970s, at 8 years old. There was also a Glen Deveron 12 year old year old in the 1980s and more recently there was a 10 year old. Not until now have we had a range of original distillery bottlings to explore, The Deveron core range has been launched with 3 expressions which will all be available from this month, the new whiskies are The Deveron 12 Year Old, The Deveron 18 Year Old and The Deveron 10 Year Old which will only be available in France. There was mention last year of a Deveron 25 year old but no sign of it yet. The travellers amongst you will know that not much more than a year ago a Glen Deveron 16, 20 and 30 year old were released exclusively in travel retail, they are still currently available but Dewar’s tell me that these will be phased out slowly and I would guess perhaps replaced by the same expressions but under the new The Deveron brand name. The Macduff distillery is located where the river meets the sea, it sits near the mouth of the River Deveron, shortly before its cool waters join the restless surge of the North Sea. An uneven number of stills is unusual in a distillery; the whisky the Macduff produces emanates from five of the smallest copper pot stills in Scotland – two wash stills and three spirit stills. A further curiosity is the unique set-up of the spirit still lyne arms, which very slightly ascend before joining the horizontal condensers. They cool down and purify the spirit by enabling greater copper contact which leads to less sulphurous compounds. The distillation process and its unconventional condensers are arranged for a light, fruity spirit and only Spanish sherry and American ex-bourbon oak casks, mainly hogsheads, are used for maturing The Deveron single malt. The specially selected casks impart depth to the delicate spirit, granting it a more rounded and smoother character. The result is a smooth, easy drinking dram with apple notes, dried fruits and nuts. Each expression has been launched in selected markets around the world including Canada, France, Germany, Japan, Russia, Sweden, Taiwan, United States and United Kingdom.